Our standard color chart offers 17 of the most popular colors we use, in stock at all times, making for faster lead times. 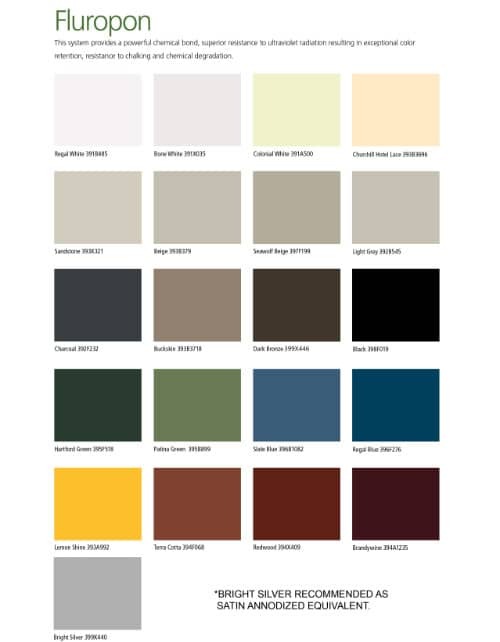 There are approximately 200 standard RAL colors that are available at an additional cost. We also work together to create custom colors with different levels of gloss finish. If you need a sample just ask. Berridge has standard options and premium or metallic color choices that can be added for a nominal fee. We offer roll forming, shearing and computerized breaks to help form your next project. We manufacture and install flashing, standing seam awnings, coping, soffit panels, Hyperion canopies and complete roofing systems with Berridge materials. However, there are other options for coated sheet and coil if your job needs more choices. Standard color choices from Valspar’s Classic Flouropon 2-Coat System. We recommend bright silver as the color equivalent to a satin anodized look. Valspar offers hundreds of colors to choose from through various lines. We can also work with you to create a custom color, at an additional cost. Aluminum Anodizing is the electrochemical process used to increase the thickness of the natural oxide layer on the surface of metal parts. This process is available in the following colors: Satin Anodized, Gold, Champagne, Light Bronze, Medium Bronze, Dark Bronze, Black, and shades along this spectrum. The most popular choice for anodizing architectural sunshades and canopies is Satin Anodizing. We will match specified colors if needed and will match samples from your project. Looking for more info on our sun control devices?